Have you ever accidentally clicked on a mobile ad? Not only does it slow you down from your task, but it also makes the advertiser pay for a wasted click-through. But Google has examined the layout of ads and has been examining this issue to see if it could come up with a solution for this problem. Apparently, the guys in Mountain View believe that they have solved this by adding a new function called "confirmed clicks" which Google will add into all in-app image ad banners on smartphones. Simply, the new feature reduces accidental clicks by forcing the user to confirm that he or she meant to click on the ad. Google's research found most accidental click-throughs happen at the outer edge of the ad when you are trying to click on or scroll to nearby content. 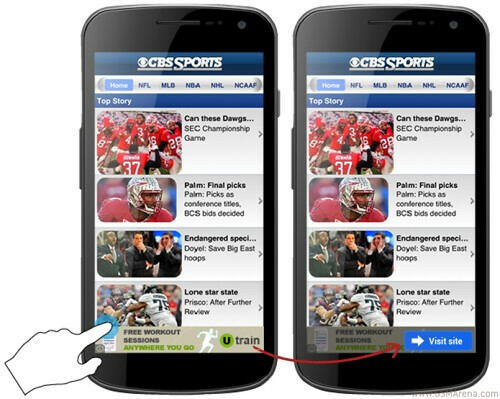 A few years ago, Google tested "confirmed clicks" with text ad banners on smartphones. In those cases, clicking on a blue arrow took you directly to the advertiser's site while a click elsewhere on the banner forced you to confirm your intention. Google has now added this to in-app image banners and found that the confirmed clicks system let to a slight improvement in mobile conversion rates with a slight drop in click-through rates as accidental clicks were eliminated. Google feels that by solving what is known as the "fat finger" problem with the "confirmed clicks," Google is helping "users, advertisers, publishers, and the mobile ecosystem overall." It might not seem like a big deal, but when you are in a rush to get to a specific page and you end up at an advertiser's site, it can be pretty frustrating. Great!!!! A much needed feature. Google seems to be just on a roll theses days as it continues to refine and update Android. I give credit to the competition from MS and iOS and even BB10 it has caused Google to come out swigging to stay far ahead of everyone else. Competition is Good. Will this be supported in all android versions ? because I am running 2.3. About time, thank you Google! Whatever. Just make a maps app that is as good as the one you bult on iOS. This is getting me really mad.